Japanese Konjac Sponge products are 100% natural, vegan, have no parabens/preservatives, is Non-GMO, biodegradeable, and Eco-friendly. The Japanese Konjac Sponge is well-known to remove dirt, oil, blackheads, and dead cells while it gently exfoliates skin, leaving a healthy and radiant skin beneath. ​It contains positive minerals and antioxidant ingredients that help nourish and smooth skin naturally. The sponge can be used with or without cleanser. 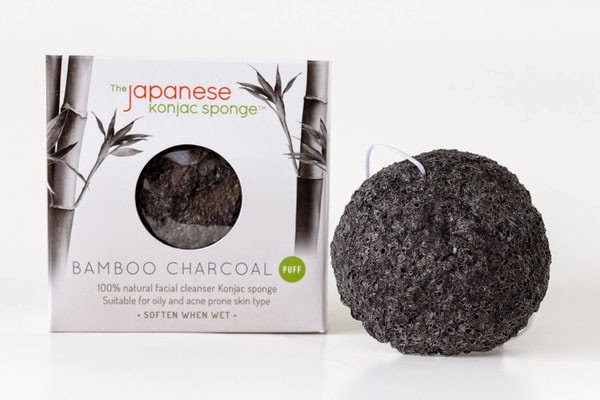 The Japanese Konjac Sponge - Bamboo Charcoal Konjac Puff is excellent for sensitive, oily, and acne prone skin. This facial cleansing puff is created by adding activated bamboo charcoal powder to the Konjac mixture. Bamboo charcoal is charcoal made from bamboo plants. In Japan, bamboo charcoal is used for food mixture, cosmetics, and medicines. Bamboo charcoal contains mineral contents such as potassium, calcium, iron, and sodium. Combining with Konjac, the absorptive carbon of the bamboo charcoal eliminates oil, draws dirt, and excess sebum out of pores which keep the skin clean and sparkle.